The Peshtigo fire was a very large forest fire that took place on Sunday, October 8, 1871, in northeastern Wisconsin, including much of the Door Peninsula, and adjacent parts of the Upper Peninsula of Michigan. 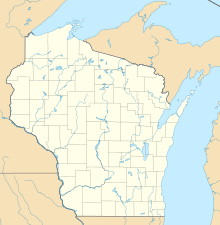 The largest community in the affected area was Peshtigo, Wisconsin. It burned approximately 1,200,000 acres (490,000 ha) and was the deadliest wildfire in American history, with the estimated deaths of around 1,500 people, and possibly as many as 2,500. Occurring on the same day as the more famous Great Chicago Fire, the Peshtigo fire has been largely forgotten. On the same day as the Peshtigo and Chicago fires, Holland and Manistee, Michigan (across Lake Michigan from Peshtigo), and Port Huron at the southern end of Lake Huron also had major fires, leading to various theories by contemporaries and later historians that they had a mutual cause. By the time it was over, 1,875 square miles (4,860 km2 or 1.2 million acres) of forest had been consumed, an area fifty percent larger than the U.S. state of Rhode Island. Twelve communities were destroyed. An accurate death toll has never been determined, because local records were destroyed in the fire. Between 1,200 and 2,500 people are thought to have lost their lives. The 1873 Report to the Wisconsin Legislature listed 1,182 names of deceased or missing residents. In 1870, the Town of Peshtigo had 1,749 residents. More than 350 bodies were buried in a mass grave, primarily because so many had died that no one remained alive who could identify all the bodies. The fire jumped across the Peshtigo River and burned on both sides of the inlet town. Survivors reported that the firestorm generated a fire whirl (described as a tornado) that threw rail cars and houses into the air. Many escaped the flames by immersing themselves in the Peshtigo River, wells, or other nearby bodies of water. Some drowned while others succumbed to hypothermia in the frigid river. The Green Island Light was kept lit during the day because of the obscuring smoke, but the three-masted schooner George L. Newman was wrecked offshore, although the crew was rescued. At the same time, another fire burned parts of the Door Peninsula; because of the coincidence, some incorrectly assumed that the fire had jumped across the waters of Green Bay. [Note 1] In Robinsonville (now Champion) on the Door Peninsula, Sister Adele Brise and other nuns, farmers, and families fled to a local chapel for protection. There they participated in prayers and devotions to the Virgin Mary. Although the chapel was surrounded by flames, it survived. Those gathered at the chapel considered their survival a miracle. One speculation, first suggested in 1883, is that the occurrence of the Peshtigo and Chicago fires on the same day was not just a coincidence, but that all the major fires that occurred in Illinois, Michigan and Wisconsin on that day were caused by the impact of fragments from Biela's Comet. This theory was revived in a 1985 book and investigated in a 2004 paper to the American Institute of Aeronautics and Astronautics. Scientists with expertise in the area argue that meteorites cannot ignite a fire, as they are cold to the touch when they reach the Earth's surface, and there are no credible reports of any fire anywhere having been started by a meteorite. Additionally, various aspects of the behaviors of the Chicago and Peshtigo fires attributed to extraterrestrial agency have more mundane explanations. In any event, no external source of ignition was needed; numerous small fires from land-clearing operations and other causes were already burning in the area after a tinder-dry summer, generating so much smoke that the Green Island Light was kept lit continuously for weeks before the main fire. All that was needed to generate the firestorm, as well as other fires in the Midwest, were the winds from the front that moved in that evening. 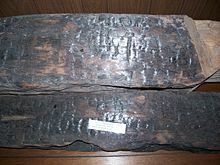 The Peshtigo Fire Museum, just west of U.S. Highway 41, has a small collection of artifacts from the fire, first-person descriptions of the event, and a graveyard dedicated to victims of the tragedy. A memorial commemorating the fire was dedicated on October 8, 2012 at the bridge over the Peshtigo River. The chapel where Sister Adele Brise and others sheltered from the fire has become the National Shrine of Our Lady of Good Help. The site is a Marian shrine, where visitors can make religious pilgrimages. The combination of wind, topography and ignition sources that created the firestorm, primarily representing the conditions at the boundaries of human settlement and natural areas, is known as the Peshtigo Paradigm. The condition was closely studied by the American and British military during World War II to learn how to recreate firestorm conditions for bombing campaigns against cities in Germany and Japan. The bombing of Dresden and the even more severe bombing of Tokyo by incendiary devices resulted in death tolls comparable to the atomic bombings of Hiroshima and Nagasaki. ^ "Because of the timing, many people later thought—incorrectly, it now appears—that this fire was an offshoot of the one that had struck Peshtigo and that it had somehow jumped across the 30-mile-wide bay." ^ a b Biondich, S. (2010-06-09). "The Great Peshtigo Fire". Shepherd Express. Retrieved 2011-11-09. ^ Knickelbine, Scott (29 August 2012). The Great Peshtigo Fire: Stories and Science from America's Deadliest Fire. Wisconsin Historical Society Press. ISBN 978-0870206023. ^ Christine Gibson. "Our 10 Greatest Natural Disasters". American Heritage, vol. 57, no. 4 (August/September 2006). ^ John Steele Gordon. "Forgotten Fury". American Heritage, vol. 55, no. 4 (April/May 2003). Retrieved May 24, 2017. ^ Hemphill, Stephanie (November 27, 2002). "Peshtigo: a tornado of fire revisited". News and Features. Minnesota Public Radio. Retrieved March 30, 2008. ^ a b Gess, D.; Lutz, W. (2003). Firestorm at Peshtigo: A Town, Its People, and the Deadliest Fire in American History. New York: Macmillan. ISBN 978-0-8050-7293-8. OCLC 52421495. ^ Kim Estep. "The Peshtigo Fire" Green Bay Press-Gazette. National Weather Service. ^ Wisconsin Department of Natural Resources. Wisconsin Wildfires > 250 Acres, 1871 — Present. September 11, 2017. ^ Everett Rosenfeld. Top 10 Devastating Wildfires: The Peshtigo Fire, 1871". Time, June 8, 2011. ^ Wisconsin. Legislature. Assembly (1873). Journal of Proceedings. pp. 167–172. Retrieved 8 August 2013. ^ United States Census Bureau. The Statistics of the Population of the United States ... Compiled, from the Original Returns of the Ninth Census (June 1, 1870), Vol. 1. Washington, D.C.: G.P.O., 1872, p. 292. ^ "1870 Federal Census of town of Peshtigo". Rootsweb.ancestry.com. Retrieved 2013-10-08. ^ Hipke, Deana C. "The Great Peshtigo Fire of 1871". Retrieved 2013-01-26. ^ "Green Island Lighthouse". Terry Pepper. Retrieved 2010-11-26. ^ a b Watson, Benjamin A. 1993. Acts of God: The Old Farmer's Almanac Unpredictable Guide to Weather and Natural Disasters. New York: Random House, p. 106. ^ "Shrine escaped devastation of Peshtigo Fire", The Compass, February 17, 2011. Retrieved October 8, 2013. ^ "Robinsonville: A Wisconsin Shrine of Mary", Catholic Herald, Milwaukee, Wisconsin, May 23, 1935. Retrieved October 8, 2013. ^ a b c Cipin, Vojtech (2011). "Troubles and Miracles". Shrine of Our Lady of Good Help. Archived from the original on 2013-11-27. Retrieved March 1, 2013. ^ Waskin, Mel (1985). Mrs. O'Leary's Comet: Cosmic Causes of the Great Chicago Fire. Academy Chicago Publishers. ISBN 0897331818. ^ Wood, Robert M. (2004). "Did Biela's Comet Cause The Chicago And Midwest Fires?" (PDF). American Institute of Aeronautics and Astronautics. Archived from the original (PDF) on March 25, 2009. Retrieved May 31, 2012. ^ a b Calfee, Mica (February 2003). "Was It A Cow Or A Meteorite?". Meteorite Magazine. 9 (1). Retrieved 2011-11-10. ^ Bales, R. F.; Schwartz, T. F. (April 2005). "Debunking Other Myths". The Great Chicago Fire and the Myth of Mrs. O'Leary's Cow. McFarland. pp. 101–104. ISBN 978-0-7864-2358-3. OCLC 68940921. ^ a b Bales, R. F.; Schwartz, T. F. (April 2005). "Debunking Other Myths". The Great Chicago Fire and the Myth of Mrs. O'Leary's Cow. McFarland. p. 111. ISBN 978-0-7864-2358-3. OCLC 68940921. ^ "Keepers of the Light – 1871 account". Survivor Stories of the Peshtigo Fire. Oconto County WIGenWeb Project. Retrieved 2011-11-20. ^ "Large Crowd Attends Fire Monument Event." 2012. Peshtigo Times (11 October). ^ a b Tasker, G. (2003-10-10). "Worst fire largely unknown". The Baltimore Sun. Retrieved 2013-10-09. Ball, Jacqueline A. Wildfire! 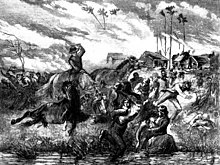 The 1871 Peshtigo Firestorm. New York: Bearport Pub., 2005. ISBN 1597160113. Holbrook, Stewart. "Fire Makes Wind: Wind Makes Fire". American Heritage, vol. 7, no. 5 (August 1956). Pernin, Peter. "The Great Peshtigo Fire: An Eyewitness Account," Wisconsin Magazine of History, 54: 4 (Summer, 1971), 246–272. Wells, Robert W. Fire at Peshtigo. Englewood Cliffs, NJ: Prentice-Hall, 1968. "The Fire Fiend" New York Times, October 13, 1871. DeLaluzern, Guillaume (Oct 1871). "IN WISCONSIN. Particulars of the Burning of Williamsonville and Peshtigo – Frightful Number of Deaths". Green Bay Advocate. Geyer, Rev. Kurt (October 6, 1921). "History of the Peshtigo fire, October 8, 1871". Peshtigo Times. Retrieved March 1, 2013. Hipke, Deana C. The Great Peshtigo Fire of 1871 Web site about fire with survivors' stories. "Peshtigo: a tornado of fire revisited". Minnesota Public Radio. Retrieved March 1, 2013. "Survivor's stories". Rootsweb.com. Retrieved March 1, 2013. "Peshtigo fire photos". Wisconsin Historical Society. This page was last edited on 12 March 2019, at 14:24 (UTC).